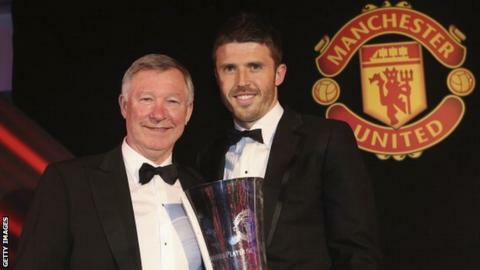 Former Manchester United manager Sir Alex Ferguson says Michael Carrick is "the best English player" around. Louis van Gaal's side have won six out of seven games since Carrick, 33, came back from an ankle injury in November. "I think Michael's the best central midfielder in English football," Ferguson told BT Sport. "I think he's the best English player in the game." Ferguson also said to "watch United go" once Van Gaal's squad - third in the Premier League - is fully fit. Carrick - named United vice-captain on Friday - won a recall to the England squad shortly after his return to fitness in November, but had to pull out with a minor groin problem. His early-season absence has been one of a number of injury problems to trouble Van Gaal since he began work as United's manager in July. Argentine winger Angel Di Maria returned from injury as a substitute during Saturday's 1-1 draw at Aston Villa, yet Ander Herrera, Marouane Fellaini, Marcos Rojo, Chris Smalling, Luke Shaw and Daley Blind all remain sidelined. "I don't know how Louis van Gaal can expect to get the best results with the injuries he's had," Ferguson added. "He brings a lot of experience but also a lot of composure. He can transfer my philosophy on to the pitch." "These new players will be exactly same." Ferguson said he had been particularly thrilled with the form shown this season by Spanish goalkeeper David de Gea, whom he signed in 2011. "They have still got great players," added Ferguson, who remains a director at Old Trafford after retiring as manager in 2013. "The World Cup has maybe taken a little bit out of Robin van Persie, but you watch him in the second half of the season. He will be fine. "Rooney is back flying and he will always get you a goal. Having a goalscorer in your team is always an advantage. "The one that is most pleasing to me is David De Gea. When we bought him as a kid he was really skinny but he had ability. He has special talents and he is showing that now and I'm really pleased for the kid. "When we get those players back, we will be fine."